A silly and very male horror-comedy along the lines of Shaun of the Dead. Some evil Lovecraftian monsters are planning to take over the world and, in fact, all of the worlds; all that stands between them are John and Dave, two small-town video-store employees. Perhaps it's the way I read it - in snatched half-hours before work - but John Dies at the End feels very episodic and very non-linear. It begins explosively, with an enormous alien invasion in Las Vegas and plenty of B-movie style casual deaths; and then it enters this strange sort of lull, and becomes much more focused on John and Dave and a slow build of mystery and weirdness with a strangely anticlimactic showdown. Also, the central romance is really icky: Amy is cpllege age (I'm not sure how old Dave is - I thought late twenties, but that might be completely wrong), he constantly thinks of her as a "kid", but their relationship is definitely sexual. Ugh. Oh, and David Wong is a pseudonym for a very definitely white internet columnist. 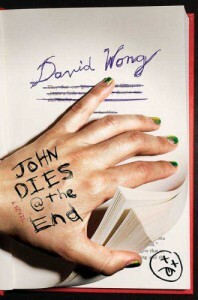 There's a reason given for this in the book (which is pseudo-biographical) - Wong is allegedly the most common surname in the world, which apparently means that Dave will be more difficult to trace - but this still reeks of white privilege wanting the advantages of racial minority without, you know, all the racism. Not completely terrible - Korrok in particular is quite a cool idea - but not very interesting, and I won't be reading the sequel.